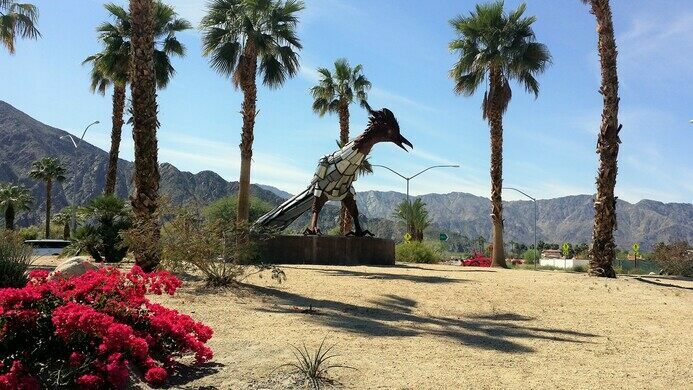 A larger than life music-loving bird has found a nest in La Quinta, California. 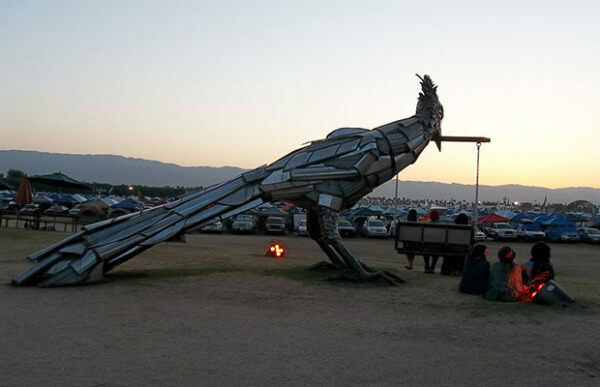 The giant roadrunner that made its debut at the Coachella Music Festival has flown a few miles west and landed in the middle of a traffic circle. 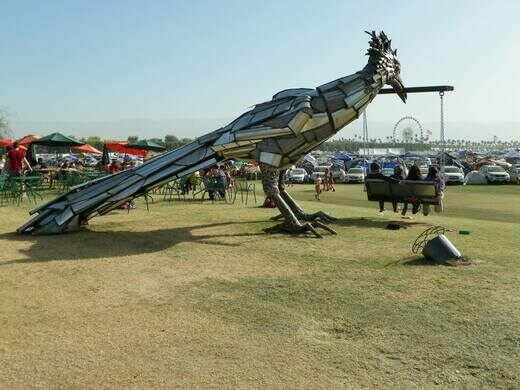 La Quinta’s big metal roadrunner started life not as a piece of public art, but as an installation at the 2014 Coachella Valley Music and Arts Festival. Sculpted by New Mexico-based artist Don Kennell, the roadrunner held a porch swing and invited visitors to rock and roll from its oversized beak. 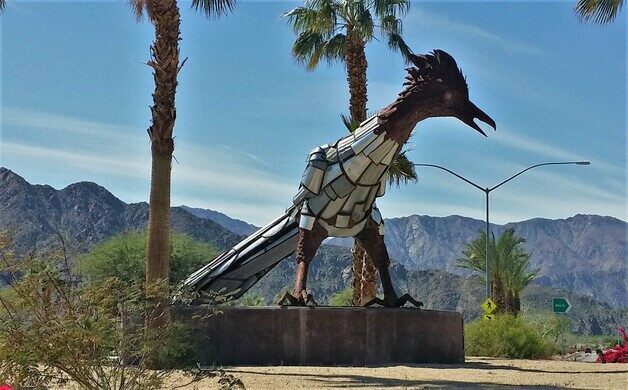 La Quinta Mayor Linda Evans, seemingly a regular Coachella attendee, saw the bird and was immediately attracted to the piece. 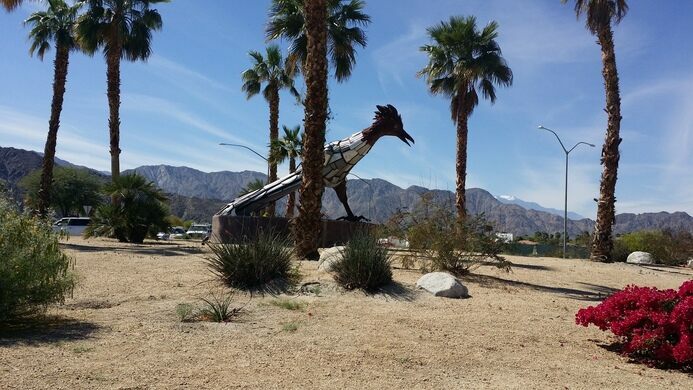 When Goldenvoice (the concert promoter behind Coachella) approached La Quinta about a four-year loan of one of the festival’s art pieces, Mayor Evans got behind the idea immediately. A year later, the giant metal bird landed at its new residence in the center of a rotary at Jefferson Street and Avenue 52 (but without the swing). Mayor Evans and La Quinta hope the sculpture stands as a testament to the partnership between the city and the ever-expanding festival, which has been a financial boon for the region. The statue sits in the middle of the traffic rotary in downtown La Quinta, at the intersection of 52nd Avenue and Jefferson Street. A monument to the frontier doctor who came up with the idea of delineating highways with a painted line.